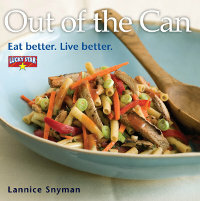 Tamsin Snyman: book publishers / culinary consultants / restaurant reviews / food and wine news / recipes. Tamsin Snyman: book publishers, culinary consultants, restaurant reviews, recipes, food and wine news. Drain the tuna. Peel and pip the melon, cut into slices, then cut the slices in half. Lightly mix together the tuna, mayonnaise, celery, apple and spring onion in a bowl. Season with salt and pepper. 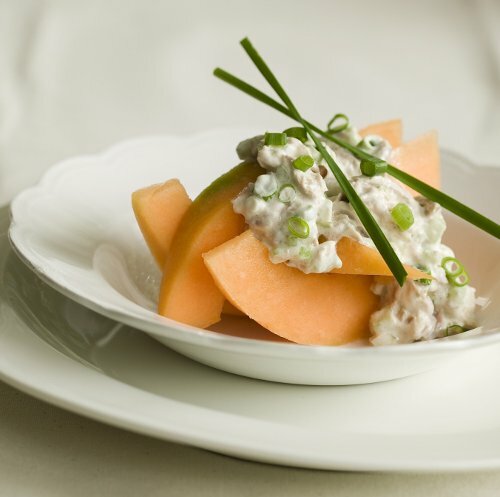 Arrange the melon slices onto plates and spoon the tuna mixture in between the slices and on top. Garnish, if you wish, with extra sliced spring onion and whole chives. * Melons are summer fruit which include spanspek, watermelon, honeydew melon and cantaloupe. When shopping for melons, check for ripeness by smelling them. If melons aren’t in season, substitute pawpaw, papino or avocado in this salad. * Lucky Star Tuna has a convenient easy-opening lid. Copyright © 2002-2017 Tamsin Snyman. All rights reserved.